The following information should answer your questions about the dimensions of the barn, carriage house, garage, shed and workshop plans. If not, you're very welcome to order the plans, review them at your convenience, show them to your contractor or building department and then return them at any time for a full refund if they don't meet your needs. 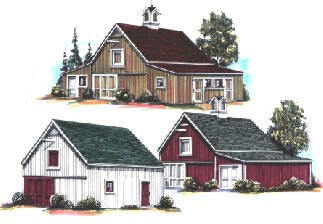 Scroll down to find the dimensions of the barn, garage, carriage house, workshop or shed that you're interested in. Floor Area of Main Garage - 786 Sq. Ft.(32'x24'), Floor Area of Storage Loft - 786 Sq.Ft. Main Barn Ceiling Height" 8'-5". Loft Height: 10'-8" at Center, 2'-8" at Eave Side Walls. 492 square feet of the Loft floor area has full standing room. Floor Area of Main Barn/Garage - 480 Sq. Ft.(20'x24'), Floor Area of Storage Loft - 480 Sq.Ft. Add-On Sheds are 10'x24' (240 Sq.Ft.) and 12'x24' (288 Sq.Ft). They are designed for use as horse stalls, open shelters, run-ins, carports, garages, tractor shelters, workshops, garden sheds, open equipment shelters and woodsheds, and are planned to be easy-to-build on either side of the Main Barn. They may be built at the same time as the main barn, as shown in the various sample designs, or added later as your needs grow. Floor Area of Main Barn/Garage - 1,008 Sq. Ft.(24'x42'), Floor Area of Storage Loft - 1008 Sq.Ft. Main Barn Ceiling Height" 8'-5". Loft Height: 10'-8" at Center, 2'-8" at Eave Side Walls. 650 square feet of the Loft floor area has full standing room. Floor Area of Main Garage - 912 Sq. Ft.(38'x24'), Floor Area of Storage Loft - 912 Sq.Ft. Main Barn Ceiling Height" 8'-5". Loft Height: 10'-8" at Center, 2'-8" at Eave Side Walls. 588 square feet of the Loft floor area has full standing room. Floor Area of One-Car Garage and Workshop Layout #1 - 402 Sq.Ft. Floor Area of Storage Loft - 300 Sq.Ft. Floor Area of One-Car Garage and Workshop Layout #2 - 438 Sq.Ft. Floor Area of Storage Loft - 336 Sq.Ft. 240 square feet of the Loft floor areas have full standing room. Floor Area of Main Barn/Garage - 672 Sq. Ft.(24'x28'), Floor Area of Storage Loft - 672 Sq.Ft. Main Barn/Garage Ceiling Height 8’-6". Loft Height: 10’-8" at Center. 450 square feet of the Loft floor area has full stand-up height. Floor Area of Barn - 480 Sq. Ft.(16'x30'), Floor Area of Storage Loft - 330 Sq.Ft. 200 square feet of the Loft floor area has full standing room. Floor Area of Main Garage/Barn - 528 Sq.Ft., Floor Area of Storage Loft - 360 Sq.Ft. 134 square feet of the Loft floor area has full standing room. Floor Area of Main Garage - 576 Sq. Ft (24'x24')., Floor Area of Storage Loft - 576 Sq.Ft. Add-On Garages and Workshops are 12'x12' (144 Sq. Ft.). Floor Area of Main Garage/Barn - 395 Sq.Ft., Floor Area of Storage Loft - 315 Sq.Ft. 115 square feet of the Loft floor area has full standing room. Floor Area of Main Barn - 480 Sq. Ft. (20'x24'), Floor Area of Storage Loft - 480 Sq.Ft. Add-On Sheds are 10'x24' (240 Sq.Ft.) and 12'x24' (288 Sq. Ft). They are designed for use as additional horse stalls, open shelters, run-ins, carports, garages, tractor shelters, workshops, garden sheds, open equipment shelters and woodsheds, and are planned to be easy-to-build on either side of the Main Barn. They may be built at the same time as the main barn, as shown in the various sample designs, or added later as your needs grow. Floor Area of Barn - 512 Sq. Ft.(16'x22'), Floor Area of Storage Loft - 382 Sq.Ft. 210 square feet of the Loft floor area has full standing room. Floor Area of Main Garage/Barn - 576 Sq. Ft (24'x24')., Floor Area of Storage Loft - 576 Sq.Ft. Add-On Sheds are 12'x12' (144 Sq. Ft.), 12'x18' (216 Sq.Ft. ), 12'x24' (288 Sq. Ft), 10'x18' (180 Sq.Ft. )and 10'x24' (240 Sq.Ft). They are designed for use as additional storage space, open shelters, carports, garages, tractor shelters, workshops, garden sheds, open equipment shelters and woodsheds, and are planned to be easy-to-build on either side of the Main Garage/Barn, or across the back. They may be built at the same time as the main barn, as shown in the various sample designs, or added later as your needs grow. Floor Area of Main Garage/Barn - 432 Sq.Ft. (18'x24'), Floor Area of Storage Loft - 432 Sq.Ft. Add-On Sheds are 12'x12' (144 Sq.Ft. ), 12'x18' (216 Sq.Ft. ), 12'x24' (288 Sq. Ft), 10'x18' (180 Sq.Ft. )and 10'x24' (240 Sq.Ft). They are designed for use as additional storage space, open shelters, carports, garages, tractor shelters, workshops, garden sheds, open equipment shelters and woodsheds, and are planned to be easy-to-build on either side of the Main Garage/Barn, or across the back. They may be built at the same time as the main barn, as shown in the various sample designs, or added later as your needs grow. Floor Area of Barn - 352 Sq. Ft.(16'x22'), Floor Area of Storage Loft - 352 Sq.Ft. Floor Area of Main Garage/Barn - 576 Sq.Ft. (24'x24'), Floor Area of Storage Loft - 576 Sq.Ft. Floor Area of Main Garage/Barn - 560 Sq.Ft., Floor Area of Storage Loft - 420 Sq.Ft. 156 square feet of the Loft floor area has full standing room. Don Berg is a New York State and NCARB licensed architect and a member of the American Institute of Architects. He has been a guest and consultant on HGTV. His designs, articles and interviews have appeared in Better Homes & Garden's Home Plan Ideas Magazine, Period Home Magazine, Mother Earth News, Traditional Building Magazine, Home, The Old House Journal, Hudson Valley Magazine, Grit, Yankee Home Magazine and dozens of other magazines and newspapers from coast to coast. He has written fifteen books on traditional American architecture and landscape design. Thanks again for your interest and your time.